Almost a year ago, I posted my first Budget Clean Snacks article here on Moving Scouse, showcasing a little haul from Aldi. Recently, Isla and I were on our way to the playground and got rained on, so we took refuge in the local outlet for a few minute, waiting for it to blow over… and ended up finding quite a few things! At the moment, they have coconut oil spray, almond butter and organic spinach pasta on specialbuy. These are more cupboard staples than snacks, but which I couldn’t resist picking up at a cut price. Regular purchases for me are the pea snacks – one of my absolute favourite snacks in the world, and I always take a bag to work. Be careful when purchasing, though, there are several different flavours and some contain dairy, so read the label! I also always have a stash of the Moser Roth chocolate bars around. They come in several different varieties (again, not always vegan, so check) and they’re the perfect snack size. They’re ideal for an evening dessert, and I usually take one to work as well to keep myself from going to the shop and buying a family-sized bar of chocolate (although that happens, too). The Paleo bars aren’t really my thing, as I really struggle with fruit-and-nut based bars. They always make me feel a bit sickly. But Jake loves them, so we always pick up a few for his work snacks. They’re excellent budget replacements for naked bars, although the flavours aren’t quite as exciting. I also regularly buy the quinoa and rice mix. I usually make some quinoa ahead for the week, but sometimes, when I get home from work completely exhausted, having these pouches in the cupboard are the reason we manage to have a semi-healthy dinner and not order pizza. Finally, an extra-exciting newbie: coconut milk ice cream! I didn’t actually get to try this, but my family assure me that it’s very nice. They described the texture as frozen whipped coconut cream, so I’m very excited to try it for myself. It exists in chocolate flavour as well, and the ingredients list is reasonably short. Have you found any exciting budget snacks recently? I’d love to read about them in the comments and pick some up! Let’s face it: we all follow about a million Instagram accounts dedicated to fitness and healthy food, filled with flatlays of expensive workout clothes and pitaya smoothie bowls. We hope that they’ll inspire us to lead a similarly healthy lifestyle, and while they can definitely be motivating, they can also make you feel really inadequate. Not because there’s anything wrong with pitaya smoothies, but because they often fail to showcase the days where you don’t workout because you feel like crap, or even just because you got sucked into Netflix at 8AM on a Saturday (enjoy it, that ends when you have kids). These accounts also often don’t show the sheer indulgent food that is eaten on special occasions, during get-togethers, or just because. I kind of understand why – if you’re running an account aimed at inspiring people to eat well and get their arses to the gym, posting pictures of a 12-pack of doughnuts is counterintuitive. But what we have to remember is this: no one lives like that. Everyone indulges sometimes, and everyone overindulges. There’s nothing wrong with that. Tone It Up recently state that they never talk about ‘cheat days’, because enjoying a treat isn’t cheating. I wholeheartedly agree with that. Enjoy your pizza, your chocolate chip cookies, or your coconut cake with vegan swiss meringue buttercream (see picture – I was practising, I don’t usually go that mad on the fancy baking). But once you’ve enjoyed it, bounce back. Don’t feel guilty or try to ‘compensate’ for your treat, but just go straight back onto your plan, whatever that may be. I’ve put together 5 tips on bouncing back for when you’re struggling. This is a well-known one, but it’s absolutely vital. Don’t wait until tomorrow or next week or whatever. Eat a healthy, light dinner to set you up for tomorrow, unless obviously your treat was a dinner-time one! Start right now, with any steps that still work for today, and it’ll be that much easier to stay on track tomorrow morning. Starting now sets the base for every other step in this post. We all know HIIT and weights are some of the most effective workouts to tone & torch, so if you can hack it, go for it! But if you’re feeling sluggish, a bit immobile and just overall not up for a high-energy sweat session, go for some Yoga (on youtube, you don’t even need to leave your front room) or, if the weather is too glorious to stay indoors, for a walk! Just get your body back in motion so it doesn’t forget the habit. This is a well-known one, but it’s absolutely vital. Don’t wait until tomorrow or next week or whatever. Start now. Drinking plenty of water will help your body cope with extra sodium as well as supporting your digestion. If you hydrate well before bed and first thing in the morning, you’ll feel much more energised. Promise! Recently, Jake and I have been talking about how much harder it is to stay away from sugary treats if you’ve had them the day before. Talk about a vicious cycle! Everyone is different, and some people may do better going cold turkey while others might need some healthy treat options available to help them avoid the really indulgent stuff. I’m definitely in the latter group! Find out what works for you, and then choose your meals accordingly. For instance, I like making these Pumpkin Spice Doughnut Holes or these Chocolate Chunk Cookies to satisfy my sweet tooth while still getting back on track. Don’t just vaguely decide to ‘get back on track with eating healthily and working out’. Spend a few minutes focussing yourself. Plan out your meals and snacks for the next two or three days, and choose your workouts while you’re at it. Make a plan and get ready to succeed! But don’t forget to have fun. Enjoy life. Eating pizza for a week won’t cause life-long damage. Gaining 5lbs won’t kill you. Don’t stress! How do you get yourself back on track after a period of indulgence? Let me know in the comments! Giveaway | Tone It Up Goodies! If you follow me on Instagram, you might know that I won Tone It Up‘s 31 Day Challenge last autumn. As part of that, I got lots of goodies, some of which I already had! Rather than leaving them to dust on a shelf or trying to sell them, I thought I’d share my luck with you, throw in a Perfect Fit Protein packet and give it away! Leave me a blog comment on this post with your insta handle and let me know which recipe you’ll try with the Perfect Fit! I’ll choose a winner via lucky dip on Sunday, 2nd April 2017, whom I will announce on both Instagram and on this post. Hi! I’ve been away from the blog for a while. We’ve had an insane few months, but rest assured that it’s been mad in a good way, not in a bad way. A head-over-heels house move, essays, Jake starting a new job… there have been so many changes and it’s taken a while to adjust, but I’m hoping to slowly build up to more regular posting. Bear with me for a while – until I figure out the direction I’m going into and the time I have available for content creation, posts might be a bit sparse and disjointed. But we’ll get there, I promise! A few days ago, I was in Hobbycraft with Isla to pick up some crayons and paper for her. As always, I couldn’t resist a little nosey through the baking aisles, they always stock so many amazing seasonal products and we all know I love a good cake! This time, I found the Wilton Ice Cream Cookie Bowl Tin on sale – obviously I couldn’t say no. I immediately had to test it last night, which was perfect timing, as I had a long run scheduled for today and was happy to have a treat to look forward to! The cookie bowls came out perfectly, despite being veganised, and I enjoyed mine so much that I just had to share the modified recipe with you! Mix all cookie ingredients together – first with a spoon, then knead with your hands until you get a smooth dough. Spray your tin with oil, drape a circle over each mound and smoothe the dough against the mould. Bake at 180ºC for 11 minutes. Let the bowl cool, and then gently remove them from the moulds. Fill each bowl with ice cream, your toppings, and cream. Go wild with the sprinkles, otherwise it doesn’t count as a real Sundae! I was really surprised how easy it was to make the cookie bowls and I can’t wait to do it again. Healthy(-ish) bowls, chocolate chip bowls, snickerdoodle bowls… the possibilities are endless! Have you tried making cookie bowls? What did you think? 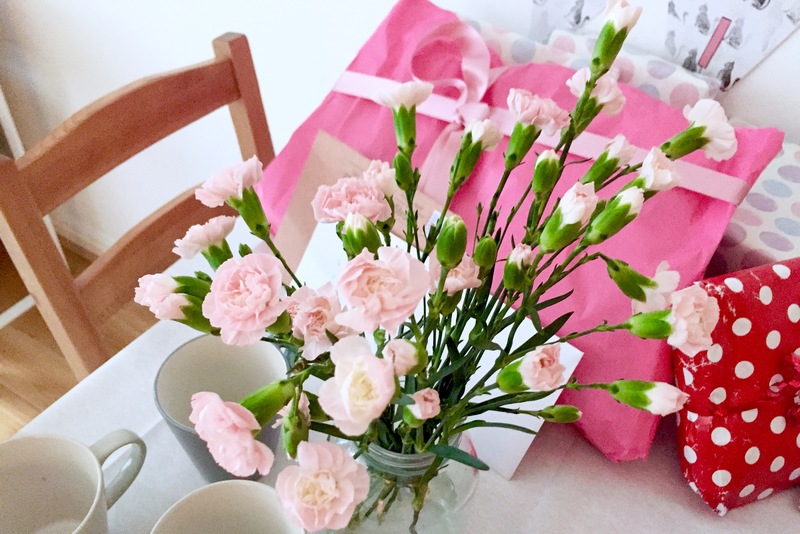 Please say hello and welcome Hollie, who runs the Piece of Vegan Cake aka Simple Choices blog. Hollie is from Liverpool and became vegetarian at around 15/16 and then gradually moved to a vegan diet. Her blog is about food. Obviously. It offers tips and advice about living and cooking vegan. There are many recipes such as Quinoa Scones and this one you must try: Homemade vegan mixed fruit crumble. These are just two of the many you can find via the Recipe Index. Also there’s some local interest with Hollie’s visit to The Old Hardware Shop and a few other places. Please take time to visit and read Piece of Vegan Cake and all the other Scouse Veggie/Vegan blogs. This year, I was really lucky and managed to snag an invitation to the Liverpool LUSH Christmas Bloggers Event. I can’t even tell you how excited I was! I was a little nervous, as I’ve never attended one of their events before, but if you’ve ever been to any LUSH shop you know that the staff are the absolute best at making you feel welcome and at home, so there was absolutely zero awkwardness involved. We were divided into groups (I was in Uninhibited – just as well, really! ), and were taken around four stations: Knot Wraps, Bath Bombs, Makeup and a Spa tour. First, we learnt to wrap up various LUSH items in their signature Knot Wrap packaging, which was one of my favourite parts of the evening. While being offered Mince Pies (including a vegan version! ), juice and mulled wine, we learnt all about the ethical background of using these wraps as packaging, and the proceeded to watch a demonstration of different wrapping (or knotting…) methods. I’ve always been a bit intimidated by LUSH’s Knot Wraps, but after seeing them in action, I really like them. Because they can be used again and again, they’re a far greener alternative to regular gift wrap, and they make killer blog photography backdrops, too ;). We also got to choose a bath bomb to receive a demonstration of: out group chose Never Mind The Ballistics, which impressed me so much that I promptly purchased it. Just look at the beautiful swirls of colour in the photo above! We then moved on to Makeup, which was interesting for me, as I’ve never used any of the products before. They’re all vegan and there are some brilliant colours to be found, so I’m really tempted to give them a go. Maybe one of their skin tints? Do you use LUSH makeup? If so, which are your favourite products? I can’t decide where to start! Finally, we were given a tour of the Spa – I have never been before, but it’s breathtakingly beautiful. I’m tempted to save up for one of their treatments, as they all sounded like such unique experiences and I love a nice spa trip. Have you ever had one? As above, recommendations are welcome! Finally, we had a little bit of time to do some shopping, which I took full advantage of. I bought some of my favourite Christmas items, especially since Isla loves her baths, and really enjoyed having the calm store around me at a time of year that’s usually absolutely nuts! Upon leaving, we were given a goodie bag with some products to try, which I’ll feature separately very soon! Now, how many christmas gifts do you reckon I can knot wrap this year…? Love a good scented candle? So does every other blogger out there, myself included! I’ve always got one burning, and have frequently found myself frustrated at the cost and the lack of scent associated with many a name-brand candle. Thankfully, there’s a small company in the North of England who make all-vegan ‘proper smelling’ candles in cute little tins, which are big enough to really enjoy the scent and warrant the cost, but small enough to be able to switch scents every so often! Harper’s Bizarre operate from Hull, visiting fairs and shipping their candles far and wide in the UK. If you ever have the chance to meet them at an event near you, definitely visit their stall. They’re a lovely bunch and they also have candles available to buy in person that you can’t find online – these are usually remnants of scent experiments that never quite made it into their permanent range and some of them are absolutely AMAZING. Their ‘normal’ ranges are a thing of beauty, too. I regularly order sets of 3 (for £20, as opposed to single candles for £8) and burn my way through them. In the summer, I purchased Cinnamon Doughnut, Alabama Peace and Rhubarb & Custard, which were all lovely, although the cinnamon one was slightly strong for my taste. I’m currently burning their limited edition autumn candle, Little Black Cat, before moving on to one of the Christmas ones. I also have a pumpkin-scented one waiting, but I think that may have to wait until next year as I sort of missed the season! I’m particularly excited for that though, because I have a pumpkin problem. The standard-sized candles are all double-wicked and made with high-quality wax, which means that they melt relatively fast and very evenly. This makes the dreaded ‘memory ring’, the phenomenon of the flame ‘tunneling’ downwards and wasting much of your candle, a thing of the past, which is wonderful because I regularly experienced this problem with jar candles. I don’t buy any other brand of scented candle anymore, as I know these are certified vegan and consistently smell wonderful. I do think the price tag for individual candles is a little high, but if you can justify splurging £20 + P&P every few months, buying them in set of three is well worth it! I spend a lot of my social media time these days on Instgram, as it’s quite possibly the most sophisticated and functional micro-blogging site out there (sophisticated in terms of usability, not content… that one’s debatable :D). One of my favourite people to follow often posts photos of her kid’s (vegan) school lunch, and, as part of that, usually showcases a re-usable smoothie pouch. Now, she’s in the USA, and I’m in the UK, so the animal-themed brand I fell in love with wasn’t available here for less than £30 (no thanks), but I just couldn’t let go of the concept. Isla loves her ready-made smoothie pouches but, for several reasons, I try to avoid letting her have them too often. For one, she wants a smoothie every day. Throwing away a pouch each time adds up to a lot of unnecessary waste, and she’s not quite at the level where she would easily be able to drink a smoothie from a glass. Secondly, the store-bought smoothies, despite being only organic fruit, contain far more sugar than homemade equivalents as they are typically made with a lot of high-sugar varieties (e.g. apple and banana). That is, of course, why kids like them so much ;). I don’t want to deprive her of her smoothies because she loves them so much and, let’s face it, she could be doing a lot worse (custard creams, anyone?). So, I started looking for a different solution. Making your own smoothies is easy enough, I go for a bit of coconut milk for liquid, fat and extra calories, some spinach, some banana and either some mango & pineapple or some berries. While perusing Amazon, I found these Nature’s Little Squeeze pouches. They’re just under £13 for six and feature a clever double-ziploc at the bottom, which means they’re easy to fill (once you get the hang of it, I did have a bit of spillage the first time. The trick is to geeeeeently squeeze out the air before closing) and really easy to clean, which is important to me when you’re working with raw food for small children. They’re also freezer and dishwasher safe, come in a variety of sizes and are BPA free. All in all, these are an excellent purchase if, like me, you have a smoothie-addicted baby and want them to have a more wholesome option. As she gets bigger, I’m going to start experimenting with different additions such as flax seeds, chia seeds and nut butters, and I have my fingers crossed that this will be the start of a lifelong healthy habit! Last month, my little baby girl turned One. I can’t believe how incredibly fast it’s gone, but at the same time, it seems like she’s been with us forever. Bizarre. She’s WAY ahead in her speech development (but won’t walk), and her first and favourite word is and remains ‘cat’. Cat toys, cat books, cat pictures, she just can’t get enough. Only a few days after first saying the word, she yelled ‘CAT’ at a pigeon in the Tesco parking lot. She’s obsessed. 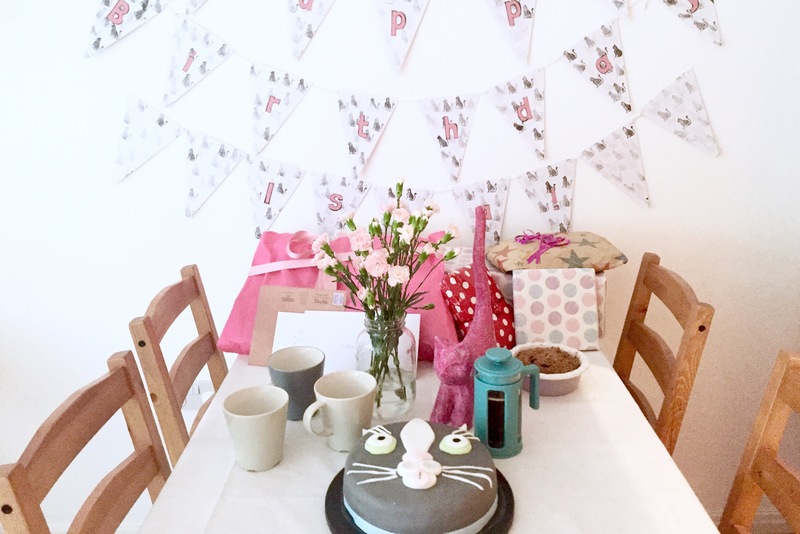 So, to honour her love of felines, we organised a cat-themed first birthday party with my family. It was a lovely, low-key day, which me spent playing, going to soft play and eating cake and sushi. 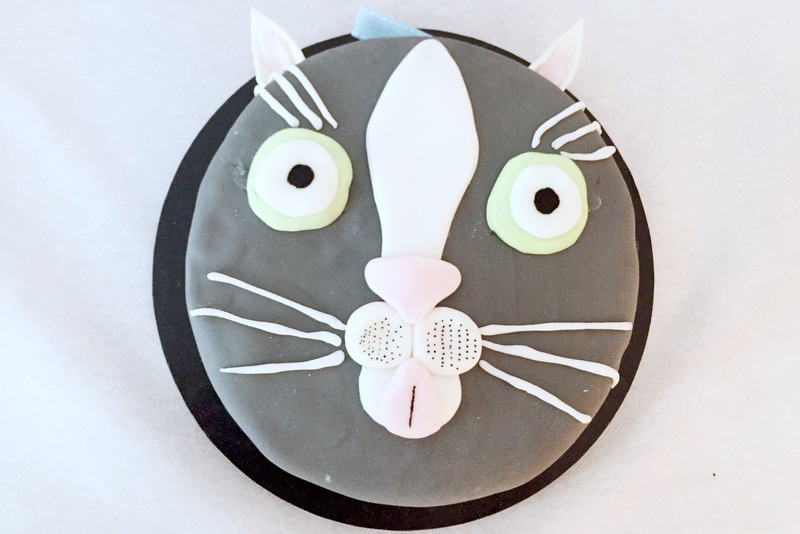 The cat cake is a simple chocolate sponge, which I decorated with sugarpaste using various images as a template. I have a whole pinterest board dedicated to the topic, so click the link in the sidebar and take a look! 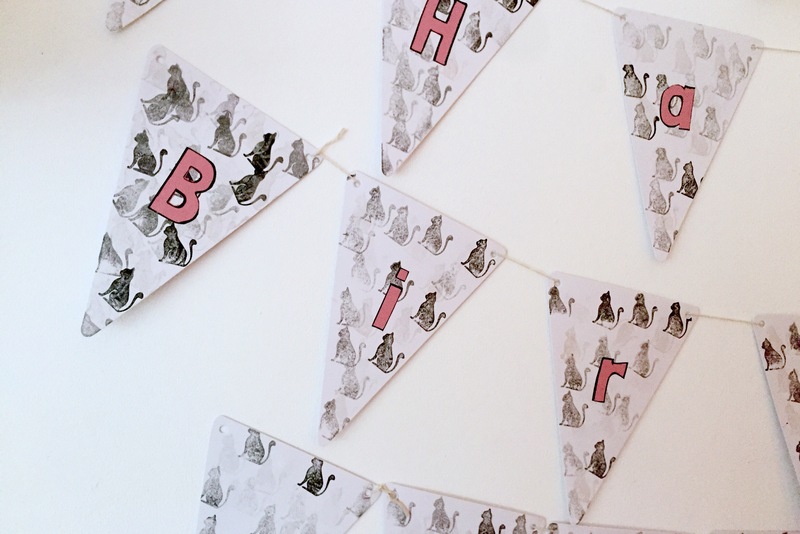 For the bunting, I bought a plain base and used a Hobbycraft cat stamp to decorate it before my mum-in-law glued on the pink card letters. 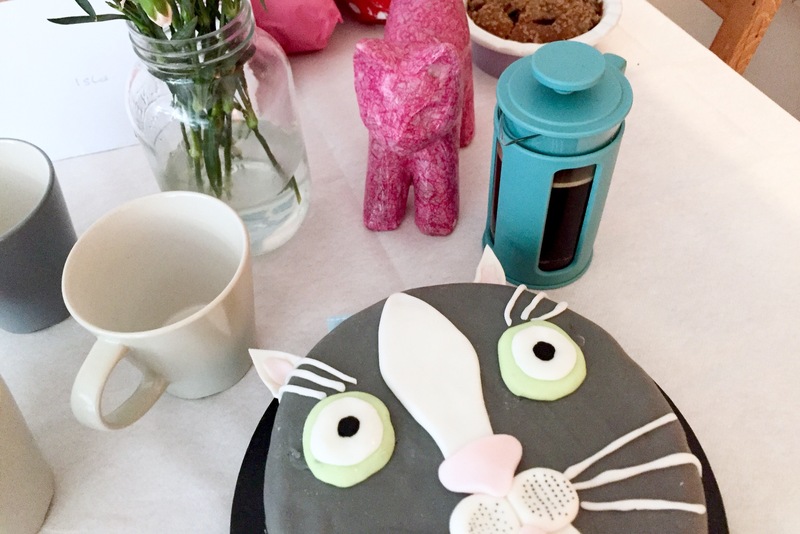 The pink cat decoration is made from a really simple base covered in pink tissue paper using the maché technique – it’s so easy, you mostly glue pieces of tissue to your base. Even I can do it and make it look more or less presentable. 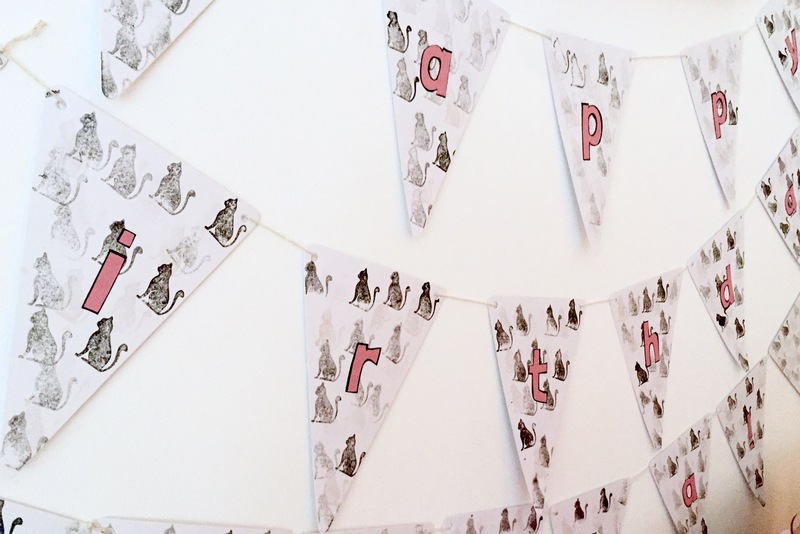 What do you think of first birthday parties? Not to be missed or way over the top? Last year, I baked along with the Bake Off for quite a while. This year, I’m a bit less organised, but I couldn’t resist sharing a recipe for Pumpkin Spice Dampfnudeln when they were featured as a technical challenge. These were one of my favourite treats when I was growing up, and because I have a pumpkin space problem, I just had to apply the world’s greatest seasonal flavour to this recipe. Unfortunately, my pot was a little too small and the tops stuck to the lid, otherwise these would have turned out absolutely perfectly! These are best served fresh, hot and with a runny custard. You can totally make your own. I totally bought mine. My favourite sweet main dish! In a large bowl, mix flour, yeast and sugar. In a jug, microwave margarine and milk until the fat melts and the mixture is lukewarm. Make sure it isn’t too hot, otherwise the yeast won’t raise the dough! Whisk vanilla, pumpkin, spices and salt into the liquid. Add liquid to dry ingredients and knead for about five minutes, until you have a pliable dough. It will be relatively wet, but should hold together quite well. If it’s completely unhandleable, add floud by the tablespoon until you reach a manageable consistency. Sprinkle flour onto a chopping board and onto your hands and form 6 – 8 ball of dough. Place them onto the board about one inch apart and cover with a wet tea towel. Leave the dough to rest and rise for 30 minutes. In a large pot, warm up the remaining milk, sugar and margarine. Place your risen dampfnudeln into the mixture, cover with a lid (it HAS to be airtight) and leave to steam on medium low heat for 30 minutes. You really really really need a wide and high pot for this. Trust me. I got it wrong.